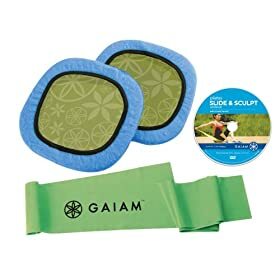 This new offering from lifestyle company Gaiam features Pilates instructor Linda Farrell. Pilates Slide & Sculpt is a 35-minute workout DVD which uses both sliding discs and a resistance band to mimic Pilates reformer work. Therefore, the DVD (which comes in a very thin cardboard sleeve) is packaged with two 9 ½" square sliding discs (with optional covers for use with hard floors) and one long green resistance band. The workout is filmed outdoors against a grassy, mountainous backdrop; Farrell is exercising barefoot on a wooden platform, and she is using the covers over her own discs. During the workout, Farrell frequently alternates between using the discs and the band, although she sometimes uses the two together for a greater challenge. She begins on the floor, using the band for the traditional Pilates warm-up, the hundred. Next comes a move which she states is adapted from the reformer, footwork: lying with a disc under each foot, you will alternate gliding one foot in and out, progressively increasing the difficulty level by raising your arms overhead, then moving both feet together, and finally adding the arms overhead with both feet. Farrell then returns to the band for the roll up and a spinal twist. Remaining in a seated position, Farrell anchors the band under the buttocks and continues with the discs, using them to stretch to the side, forward and back, and finishing with a twist; she repeats this sequence using the band. She states that the next series, stomach massage, has also been adapted from the reformer: she again places the discs under the feet and moves the feet in and out, but this time while seated. She finishes here with the Pilates criss-cross, still sliding her feet in and out while on the discs. Finally, Farrell picks up the band to conclude the seated work with rowing, chest expansion, and shaving the head. Returning to lying, this time Farrell raises her buttocks in the air before again sliding the feet in and out on the disks to work the hamstrings. She then flips over to her stomach for prone work, using the disks under her hands for moves which include the swan extension and swimming; the band is also used in this segment. The side lying or leg kick series follows; with a disc under the feet and under one hand, Farrell spends about three minutes on each side. The final floorwork segment is what she calls the knee stretch series: first, there is some work on all fours and in plank, and next, there is a sequence that flows between the yoga postures down dog and up dog, sliding with the discs under the feet. Coming to standing, Farrell calls the final eight minutes of the workout "Stand and Slide." Here she has the disks under her feet, and she lunges to the side in a fencer's lunge as well as forward and back, moving almost quickly enough to produce an aerobic effect. She also adds in the band to get the upper body involved with triceps and biceps work. The workout ends with a very brief stretch (about 1 minute) which includes a seated spine stretch forward and saw twist. In the end, I had mixed feelings about this workout. I have used gliding discs before and generally enjoy the unique challenge that they provide. However, I found that both the larger size and the square shape of these discs made them a bit unwieldy to use. In addition, my workout room has a flat, Berber-like carpet, and I found that the disks (minus the covers), did not always glide freely over this surface as intended. The other issue I had was with the workout itself, as I found the difficulty level to be quite uneven. Farrell states that the workout is "perfect for the Pilates practitioner wanting to take their workout to the next level," but I'm not sure that this is the case. There were many points in which the workout was quite easy, as Farrell starts with a very basic variation of the exercise before increasing the challenge. In other instances, however, the difficultly level was quite advanced, such as when she performs the hamstring moves with both legs. Therefore, I'm not sure exactly who the idea target audience for this workout would be, although it is probably best suited to those with some Pilates experience who are interested in adding new elements to their Pilates practice.